To be honest, after (paying for) and playing the wholly disappointing Celestial Mechanica (a game with tonnes of potential, yet so flawed that I cannot bring myself to review it in fear of breaking down into depression), I had recently lost hope of discovering worthwhile new indie 'metroidvanias' - but there's no arguing that game designer and artist rdein has done good with this latest endeavour. Despite being developed in GameMaker and complete with some of the nasty graphical glitches that come with it (screen tearing, etc. 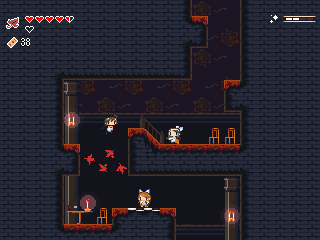 ), Momodora 2 is a charming little adventure. It's undeniably short (I took my time to explore the map fully yet still completed it within an hour), but very enjoyable while it lasts thanks to the solid design and tight controls. The shrine-maiden-vs-underworld-queen story didn't grab me in the same way that Celestial Mechanica's post apocalyptic setting did, but the fair game design and hectic run'n'shoot'n'slash gameplay more than made up for it. 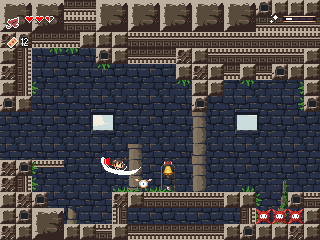 In true Metroidvania style, Momodora 2 gives the illusion of being an open world despite actually being quite linear. Back tracking and 100% map exploration isn't essential, but the additional items you'll acquire in doing so will make your quest a lot easier (and unlock a special ending, of course). 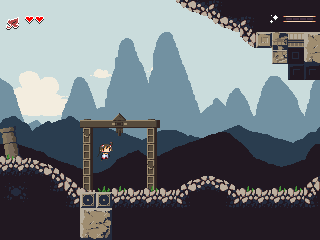 The world is varied in it's locations, with some really cool set-pieces and mini boss battles, and you'll find yourself checking the in-game map over and over to make sure you've covered all the unexplored paths, especially as each new power you collect makes progress to new areas possible. Initially attacking enemies in melee combat with a maple leaf, then later adding a ranged attack to your arsenal, the game starts off quite sedately and the difficulty ramps up to match the addition of new attacks and skills that you gain. The challenge doesn't really start until the final act, where you'll confront some of the most impressive foes in the game, but it's not so hard that it'll alienate casual players (there are save points aplenty and if you collect all the health bonuses and weapon upgrades it's pretty hard to lose). The graphics are a beautiful homage to Pixel's indie classic, and the soundtrack by Elecktrobear is both fitting and atmospheric, so no complaints there. In fact, the only grumble I have is that the mix of scrolling and flick screen sections can occasionally result in you being attacked from off screen. Oh, and the rooms containing respawning baddies do get a little tiresome near the end (but at least it keeps you on your toes whilst traversing earlier sections on the hunt for missed statues and treasure chests). In conclusion, ignoring the knee-jerk 'OMGWTFCAVESTORYRIPOFF' reaction that the indie scene will inevitably deliver, Momodora 2 is a decent little adventure that I wholeheartedly recommend and I sincerely hope that rdein delivers a third (and hopefully more fleshed-out) follow up in future. Download the game here (from the Electrobear site).